Case-Based Learning (CBL) is a non-traditional teaching methodology which helps in enhancing the learning skills. It helps in the deeper understanding of the concepts; involves students in active learning, enhances collaboration among team members, helps in nurturing analytic and interpersonal skills through well-defined cases. We looked for most prevalent teaching pedagogies being used in different domains like Medical, Law, and Business education that require brainstorming and we found CBL to be an effective approach in enhancing students learning levels by helping them to think in different perspectives for the same problem. Why CBL for Software Engineering? Software Engineering is a highly practice oriented field, concerned with the development, operation, and maintenance of software, hence providing practical knowledge for its applicability in real world becomes equally important. Software development process is primarily based on a set of well-defined requirements in which understanding and prioritizing them is important for the success of any product. It is very important to bridge the gap between the theoretical concepts at university level and practical implementation of the concepts at industry level, hence we found CBL to be an effective approach in teaching some of the SE concepts as it is a student-centric teaching methodology which focuses on learning objectives like critical thinking, brainstorming, discussions, and understanding real life scenarios with multiple perspective solutions. The backbone of SEABED  is the variety of cases and vibrant SEABED community. We are building up our SEABED community by interacting with SE practitioners, enthusiasts and researchers all over the globe. Gradually SEABED community is growing up with potential users. Along with all the researchers and SE enthusiasts, we also welcome thesis students to contribute and take this learning platform to a new level. Our idea was to create a web-based platform as a hub for SE CBL practitioners. Teachers, students, researchers, instructors, or anyone can be benefited from CBL and can find relevant cases from our open-source case repository in Case Collection section. Cases are categorized according to the various phases of Software Development Life Cycle (SDLC). It allows the interested users to contribute with their own case problems as PDF document (Case Submission). They can also upload the experience report about the CBL session, its empirical analysis and students’ feedback after conducting some CBL sessions in the University. They can revise any existing case available at SEABED, by providing proper justification document that tells the rationale behind the amendments (Case Evolution). Case Example: Twitter started as a side project of Odeon Inc. in 2006. It had immense growth nearly 1000% growth/year and soon became the micro blogging platform of choice for majority of Internet users. It had 400,000 tweets per quarter in 2007. This grew to 100 million tweets per quarter in 2008. By 2010 there were around 175 million users, 90 million tweets per day and around 500 million searches per day. Twitter was initially built with time to market in mind. So the architecture and technology to build twitter was chosen such that they can build the site in a very short time. Twitter was not designed with this kind of growth in mind. Your team has to come up with a new architecture that addresses the scalability problems of twitter. Challenges 1: What are the architectural drivers, assumptions and major constraints? Give details of at least 5 decisions related to major architectural strategies. • 2: Give the architecture in terms of system decomposition (as a diagram and text), structure, and connector and component responsibilities. This is a sample case  for Software Engineering (SE) case-based learning (CBL) practice with challenging questions. Experiment 1 - IIIT Hyderabad, India: We begin our journey when CBL was first implemented at IIIT Hyderabad for practicing SE concepts. They proposed a case based learning environment - Case Oriented Software Engineering Education model (COSEEd). It embeds problem solving as a core skill with cases as the primary learning objects. We implemented 4 course offerings with COSEEd considering UG, PG, and PGSSP (Industry participants). In all the offerings, students felt that CBL helped them in gaining learning objects along with an improvement in their communications skills. This model was successful in covering cognitive goals in SE education. The research work can be reached at . Here CBL session was conducted for 89, 3rd year UG students. CBL is found to be effective with an agreement of 74.53% students, who were able to understand all five learning principles of learning, critical thinking, engagement, communication skills, and team work. Experience report  of this implementation is available at SEABED. 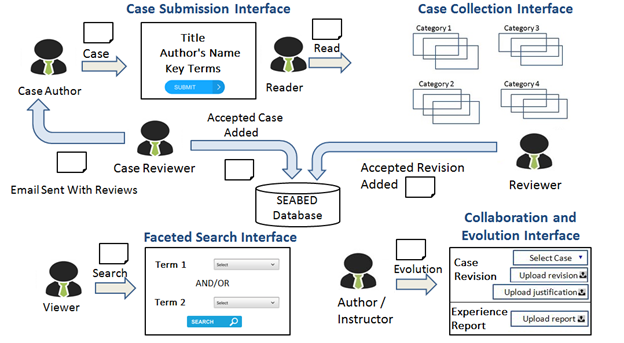 After this exercise, SEABED platform was created and we proposed a case writing template. The research work can be reached at . The CBL was introduced in two different SE courses, Software Testing and Requirements Engineering, with a number of CBL sessions. Firstly, we applied CBL for Software Testing Discipline and got appreciable responses at DAIICT, Gandhinagar, India. This was the first time when students were introduced with the concepts of CBL. This drove us to conduct more CBL sessions at DAIICT and the second time we applied CBL for practicing Requirements Engineering Concepts by providing two different RE cases  to student teams and asked them to bring solutions (PowerPoint presentations) to check the effectiveness of CBL by evaluating their results on different parameters. We also intend to perform several experiments on the same. After every CBL session we asked student teams and Teaching Assistants (TAs) to give feedback and we got positive responses this time too. We further aim to expand this by considering new research techniques on CBL implementation. So the overall analysis of the CBL experiments conducted at different Universities reveals that CBL teaching methodology can be used in teaching some of the Software Engineering concepts efficiently, supported by well-designed cases. It helps students’ in in solving real world problems by engaging themselves in thinking and discussing activities. What’s next (future opportunities): Case-based learning in Software Engineering domain is effective and there are several sub-areas that are still unexplored. Our platform does not only help students to assimilate the concepts well, but also provides a promising research area for SE practitioners and enthusiasts to submit and discuss efficient cases. We further aim to expand this work by conducting more useful sessions with other universities and experimenting CBL with more detailed observations, analysis and results. We also invite MS, M.Tech and PhD scholars to collaborate with us on CBL project. Kirti Garg, Ashish Sureka and Vasudeva Verma. 2015. A Case Study on Teaching Software Engineering Concepts using a Case-Based Learning Environment. D. Kundra and A. Sureka, “An Experience Report on Teaching Compiler Design Concepts Using Case-Based and Project-Based Learning Approaches,” 2016 IEEE Eighth International Conference on Technology for Education (T4E), Mumbai, 2016, pp. 216-219. doi: 10.1109/T4E.2016.052.